Shadi bimari is a one of the most popular social welfare scheme which is launched by state government of uttar pradesh. This scheme is launched by Samaj kalian vibhag of Uttar pradesh. Under this scheme government a lot rs 95 crore fund in 2008-2009 and total 83 crore rupee have been distributed under this Shadi bimari scheme. If you also want benefit of shadi bimari yojana of social welfare department of Uttar pradesh then you can also apply for it prescribed application .after filling application form submit it to your SWD office of Your District . Total 49555 beneficiary got the benefit under this scheme . Under this scheme 100% fund provide by state government and total 57% amount have been distribute to eligible beneficiary . 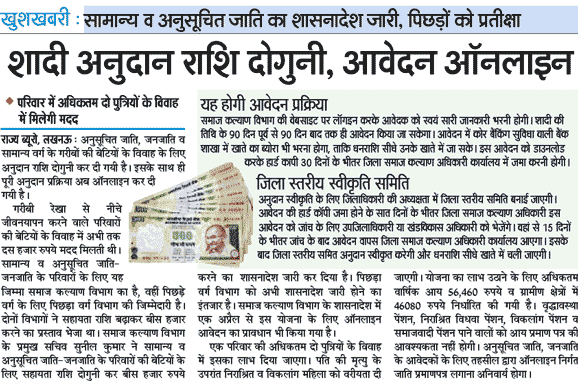 Finance department 50% release the amount for this scheme. Under this scheme all SC candidates and poor family member of general candidates can apply for the marriage of their Daughters and candidates can also apply for medical treatment. Category for filling application form for Shadi bimari yojana : All SC category candidates and poor families of General candidates can apply for Shadi and bimari yojana . Family Income must not be greater than as are following criteria: rs 25546 in Urban area and 19884 per year in rural . Benefit of this scheme. Under this scheme state government of UP provides donation for rs 10000 per family for marriage and rs 5000 for medical Treatment. In area of bundelkhand government provide Fund (anudan ) rs 20000 for marriage . Government allotted total 11500 lakh for distributed under this scheme in 2009-10. How you will get you fund : candidate are required to fill application form in prescribed application form format . Candidates are required to provide their bank account details in the application form. After that when you application form will be approved then your fund will be transferred in your bank account. How to apply for illness and marriage scheme: Candidates are required to download application form online form the official website of SWD UP Nic in or UP Online. After that submit application form in Samaj kayan vibhag uttar pradesh .